Pushing back against those who insist that the media and its American audiences are unserious and myopic, four of journalism’s top leaders used an April 15 forum honoring outgoing Wallace House Director Charles Eisendrath to insist foreign news has actually never been so relevant, popular or well-executed. Baquet sat beside CNN’s Chief International Correspondent Christiane Amanpour and POLITICO’s co-founder and editor-in-chief John Harris as NPR’s “Morning Edition” co-host David Greene moderated the 90-minute discussion titled “Beyond America: The Case for Foreign News.” University of Michigan President Mark Schlissel introduced the quartet, all of whom are Livingston Award judges. Before turning the stage over to the speakers, Schlissel paused to recognize Eisendrath for his four decades of contributions to the university and to the profession of journalism. That’s not to say there aren’t problems and concerns. 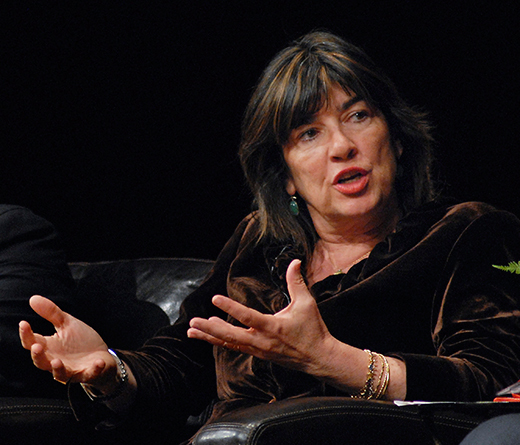 Amanpour, who came to prominence after covering the Persian Gulf War and whose work covering the Bosnian War earned a Livingston Award in 1992, expressed frustration with major news outlets slashing budgets for overseas reporting and bemoaned the fact that the areas on the globe where journalistic attention is most needed are also where it is most difficult to find out what’s happening. Some audience members, however, challenged the panel’s sunny view of the state of foreign news and Americans’ appetite for it. During a Q-and-A period, KWF ’12 Aisha Sultan of the St. Louis Post-Dispatch asked the group why the U.S. media seems to go to saturation coverage for terror attacks that occur in Europe but not, for instance, Pakistan. Greene and Baquet noted that part of the issue is how newsworthy the incidents are – attacks in Pakistan are very common but quite rare in France or Belgium – and what sort of access is even possible. The Times, Baquet said, has been kicked out of Pakistan but has dozens of reporters across Europe able to pivot to a major story there. That train of thought also led to one of the most amusing exchanges. Amanpour recalled how, in 1997, Princess Diana and Mother Teresa died within days of one another. Guilt over how intensely the death of the glamorous British royal figure was covered led many Western media outlets to give the funeral of the elderly Nobel-winning nun a lot more attention than she might have received absent the Diana mania. 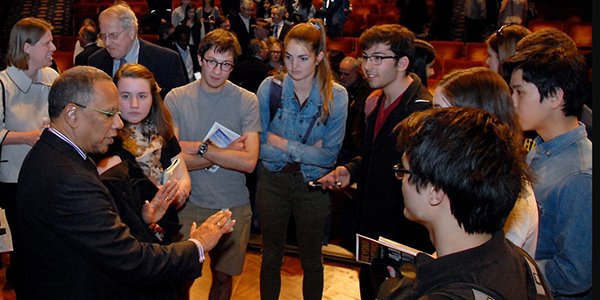 After the panel discussion, Michigan students had a chance to talk with Dean Baquet. The panelists were generally hopeful, noting that their perches as Livingston judges give them a sense of the immense young talent continually joining the profession. These upbeat observations seemed to delight viewers on social media, as when Amanpour noted that “longform is actually getting a new life” and Harris observed that more substantive pieces break through the clutter because “you’re never going to be faster than Twitter.” Dozens of people, of course, tweeted these lines. This event was co-sponsored by Michigan Radio.